This article is about the Indian nationalist leader. For the Indian historian, see Bipan Chandra. 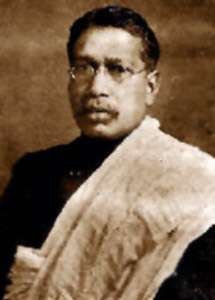 Bipin Chandra Pal pronunciation ; November 7, 1858 – May 20, 1932) was an Indian nationalist. He was among the triumvirate of Lal Bal Pal which consisted of Lala Lajpat Rai, Bal Gangadhar Tilak( Lokmanya Tilak) and Bipin Chandra Pal, himself. In 1886 he joined the Indian National Congress. At the Madras session of congress held in 1887,Bipin Chandra made a strong plea for repeal of the Arms Act which was discriminatory in nature. Along with Lala Lajpat Rai and Bal Gangadhar Tilak he belonged to the Lal,Bal and Pal trio that was associated with revolutionary activity. In fact Aurobindo Ghosh and Pal were recognised as the chief exponents of a new national movement revolving around the ideals of Purna Swaraj, Swadeshi, boycott and national education. His program consisted of Swadeshi, Boycott and national education. He preached the use of Swadeshi and the Boycott of foreign goods to eradicate poverty and unemployment. He wanted to remove social evils from the form and arouse the feelings of nationalism through national criticism. He had no faith in mild protests in the form of Non-Cooperation with the government. On that one issue, the Assertive nationalist leader had nothing common with Gandhi. During last six years of his life he parted company with the Congress and led a secluded life. Sri Aurobindo referred to him as one of mightiest prophets of nationalism. ↑ List of distinguished alumni Archived 25 September 2012 at the Wayback Machine. Owen, N (2007), The British Left and India, Oxford University Press, ISBN 0-19-923301-2 . Lenman, Bruce; Marsden, Hilary, eds. (2005). Chambers Dictionary of World History. London: Chambers Harrap. ISBN 978-0-550-10094-8 – via Credo Reference.